Spring is a crazy time of year. The kids are finishing up their school year, and everyone is anxiously awaiting summer. As the weather starts to warm up, the weather can get pretty interesting outside. Thunderstorms, tornadoes, and even just rainy days are all starting to happen, which makes this a great time to teach your kids about the weather! You don’t have to break the bank to have a fun filled lesson plan with your kids! 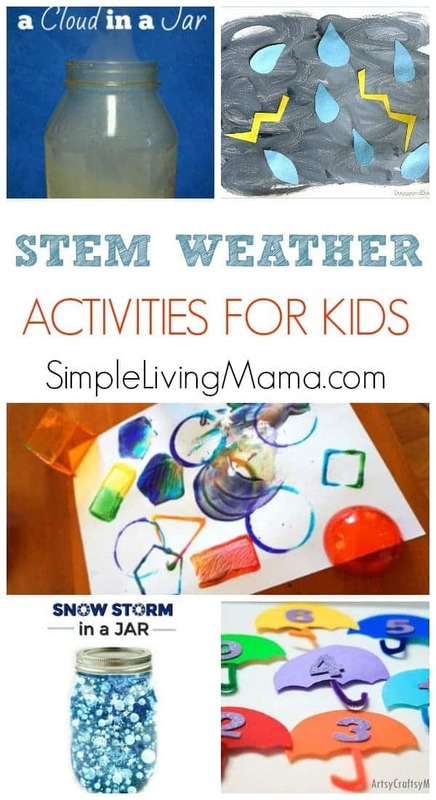 Here are seven stem weather activities for kids that are just perfect for a science unit study! Bring the idea of how clouds form to life by making a cloud in a jar! This fun science experiment will give kids a front row seat to the formation of a cloud with just a few simple items from around the house! This thunderstorm project art is the perfect way to teach your kids about the weather cycle and about mixing colors! Using paint, construction paper, and imagination, your kids will be able to create a fun art project while learning about thunderstorms. It can be hard to get your kids excited about math, but with this umbrella counting and color sorting, they can learn about weather and math! Using only colored paper, foam numbers, pipe clear bits, cello tape, buttons, and an empty round box, you can create an excellent math activity for your kids on a tiny budget. Teaching your kids about clouds don’t have to be boring. Make this pair of binoculars using toilet paper rolls! 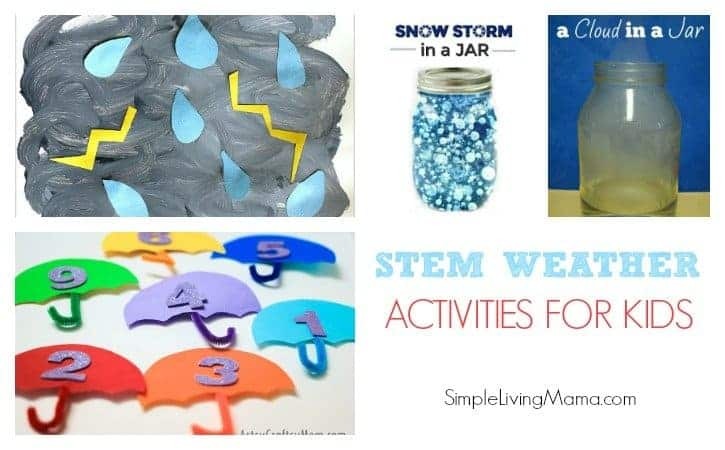 These are great for cloud-themed lesson plans, or for exploring on a rainy day. You can incorporate this craft into any weather unit study. It might not be winter, but this is a great time to teach your kids about all kinds of storms. The best part about this project is that there is no mess! You only need six ingredients, and might already have most of them in your homeschool classroom already. This is such a fun and creative activity, and I’m willing to bet that you already have all the ingredients you need right at home! Take your homemade weather vane out on blustery days and teach your child all about the wind. It wouldn’t be a weather study without talking about the wonders of a rainbow. You only need four ingredients to do this craft, and your kids can get creative! When you’re stuck indoors on a rainy day, have them do this craft to learn about rainbows and help them find one after a good storm. Weather can be such an exciting topic, especially if you have younger kids. These STEM activities will not only make sure they are learning but have fun on a small budget.